Anthony Hodgson, of Face Publications, has done it again. His first two cookbook designs, the beautiful and tactile Black Pudding and Foie Gras, and the stylish and brilliant Loose Birds & Game, written by 9 times Michelin star chef, Andrew Pern of The Star Inn, Harome in North Yorkshire, both won the Gourmand award for the Best UK Chef Book of their respective years, and both books went on to win the Silver Medal for “The World’s Best Chef Book”. Anthony went on to design “On the Menu”, written by Michelin star chef/owner, James Mackenzie, of The Pipe and Glass Inn, at South Dalton in the East Riding of Yorkshire – this fresh, smart book, overflowing with Jame’s recipes has just won the Gourmand Award for “The Best First Cookbook”, so congratulations to both Anthony and James. 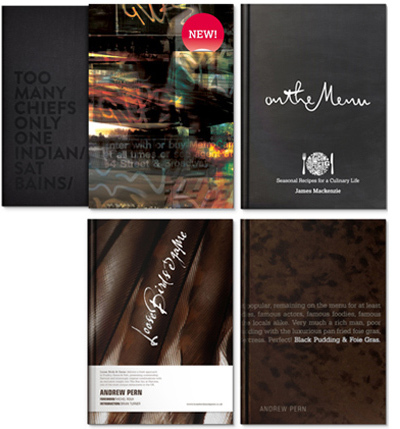 And, in culinary terms, ‘the icing on the cake’ was the news last week that not only had On the Menu won a Gourmand Award – the superb and innovative design of Anthony’s latest (and largest) book, Too Many Chiefs, Only One Indian, has also won the Gourmand Award for “The Best UK Cookbook”. This book is written by Sat Bains, the larger than life 2 Michelin star chef of Restaurant Sat Bains in Nottingham, and is innovative, and just absolutely brilliant. Both these two cookbooks will go forward to compete against other cookbooks in their categories for the Gourmand title of the “Best in The World” at Le Carrousel du Louvre, under the Pyramid of the Louvre Museum, during the Paris Book Fair next spring. I imagine that Anthony and his wife will have fun shopping for new outfits for this literary occasion. So, four cookbooks, and all have won top Gourmand Awards. So proud of my son. Who would have imagined it, all those years ago, that my little Ant would turn out such a designer. I am a very proud mum.